Making payments and inquiries on your balance can be done over the phone 24 hours a day, 7 days a week. 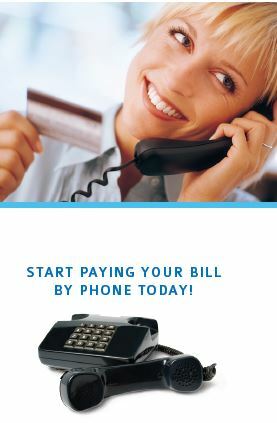 Please call 245-4000, listen to the prompts, select the appropriate extension, and you will be transferred to Alpine’s automated pay-by-phone system. The system is automated and all of your personal information, such as card number and payment amount, will be entered by YOU. At any time, you may hang up and this will discontinue the phone call. BEFORE YOU CALL YOU NEED YOUR ACCOUNT NUMBER! After dialing you will go to the main menu. You’ll be prompted to press numbers for the actions you wish to complete. To be compliant with Payment Card Industry (PCI) Data Security Standards, a Personal Identification Number must be created for the automated system. You can create this PIN through the system if your social security number or business identification number is on file with Alpine Communication and you can verify the last four digits. If that information is not available, please call Alpine at 245-4000 to create this unique PIN. To look up the information using your telephone number, Press 1. To look up your information using your account number, Press 2.